Kris Sirchio, ’83, has always seen the big picture. When he, his mother and brothers moved to Flint from New Jersey in the late 1970s, just as the auto industry was collapsing, he saw the sacrifice his mother made to send him away to Cranbrook for the final years of his education. At Cranbrook, Sirchio says, “I was a red-headed boarding student trying to be involved in as many activities as possible.” He served as a resident advisor of Stevens Hall, as president of Blue Key, president of the dorm council, an assistant editor for the Crane-Clarion and as the varsity soccer team’s first two-time captain in 30 years. It was little wonder that he was named “outstanding senior” upon graduation. He earned his undergraduate degree in political science from Duke University, where he played soccer on Duke’s 1986 Division I Men’s Soccer team, which went on to become Duke’s first national championship team in any sport. He received his MBA from Southern Methodist University in Dallas, Texas, where he earned “most outstanding student award” honors. Sirchio quickly put his talents to use with some of the world’s largest companies. For more than 13 years, he oversaw brand management for Procter & Gamble in Europe. After that, he joined Syngenta, working in Switzerland and helping the agricultural firm become one of the world’s largest lawn and garden companies. Later, he joined Brown-Forman as executive vice president and global chief marketing officer, overseeing such well-known brands as Jack Daniels and Southern Comfort. Most recently, he served as CEO of North American Breweries, one of the largest and oldest breweries in the United States. Sirchio possesses a strong interest in the environment and conservation, something that started at Cranbrook with scuba diving and grew during his 20 years living abroad. 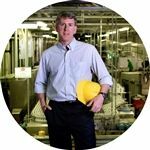 When he returned to the United States and took up his role at Brown-Forman in Louisville, he joined the board of The Nature Conservancy, Kentucky Chapter, where he has served as the board chairman since 2013. Sirchio and his wife Wendy, a former United States diplomat, co-Founded WE Kentucky, which is part of the global WE Charities organization. “WE helps young people to ignite their spark through service learning projects,” Sirchio says. The year-long program culminates in a stadium-sized event featuring musical performances and inspirational speakers. “You can’t buy a ticket to WE DAY, you earn it by leading one local and one global service project,” he adds. Sirchio’s desire to inspire and motivate young people led to the creation of one of Cranbrook’s most popular annual events, the Sirchio Lecture. Now in its 25th year, the series welcomes alumni to campus to talk about important subjects related to their own experiences or accomplishments. The series began with a talk by Daniel Ellsberg, ’48, the legendary author and activist best known for his release of the Pentagon Papers in 1969, precipitating the beginning of the end of the Vietnam War. The idea for the lecture series came to Sirchio after talking with his mother about his own grandfather’s involvement in founding the John Finley Green Distinguished Speaker Series at Westminster College in Fulton, Missouri in 1936. It was there a decade later that Sir Winston Churchill delivered his famous “Iron Curtain” speech, warning the world of the impending Cold War. “In thinking about my grandfather’s series, it hit me that if I could combine this approach with Cranbrook alumni, there could be a very special impact for students –to open new doors and help the students to dream big and imagine new possibilities for themselves, inspiring them to ‘aim high’ and create a better future,” says Sirchio.